TORONTO, Sept. 29, 2017 /CNW/ - Who, other than Hendrick's Gin, would fly for the first time in history, a wondrously illuminated Hot Air Balloon lavishly decorated with images of cucumbers, roses, and gin, "OH MY", into the night sky during Nuit Blanche in the famed Nathan Phillips Square at Toronto's City hall? Indeed…tomorrow night, on Saturday, September 30th, Hendrick's Gin, which is oddly infused with cucumber and rose, will once again bring Torontonians a taste of the unexpected, by offering a rare opportunity to view many of the Nuit Blanche art installations from 44 & ¼ cucumbers (or 44.25 feet) elevation in the air. For the first time ever, the Hendrick's L.E.V.I.T.A.T.R.E hot air balloon will be tethered at Nathan Phillips Square. If you haven't already secured your "Golden Ticket" to the stars, there will still be a chance for a select few art enthusiasts and night owls to join the standby list for the first ever hot air balloon ride at City Hall – for free. Contest winners can rest and rejuvenate in a spectacular Hendrick's Air Departure Lounge, filled with Victorian decor, magicians and mentalists, and start snapping some sky-high selfies beginning at 7:00PM on Saturday, September 30th through 7:00AM on Sunday, October 1st. "Hendrick's is a gin that elicits wonder and curiosity," comments Beth-Anne Perry, Senior National Brand Manager, Hendrick's Gin. "By bringing the L.E.V.I.T.A.T.R.E. to life in the heart of Nuit Blanche, we are hoping to "elevate" that feeling and further open the minds of the already creative and imaginative art lovers who stop by to see us. Passengers will experience a whimsical ride in a stunning Hendrick's Aircraft created by the #1 Manufacturer of Hot Air Balloons in the World: Kubichek Balloons. Each trip will accommodate three to four contest winners, will take a total of three minutes from lift off to landing, and will include custom digital photos for passengers and access to the VIP Departure Lounge. 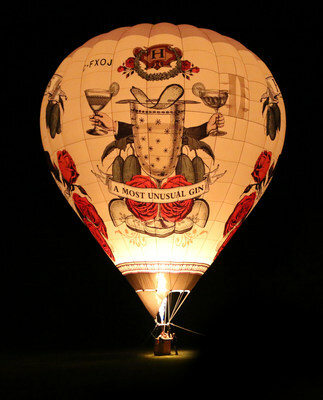 And, while the hot air balloon will mystify our air travelers with a rare bird's eye view of the world around them, Hendrick's Gin Brand Ambassador, Alvin Ramchurn, has enlisted the help of some of his time travelling mates, to occupy the minds, eyes, and taste buds of the adventurers below. To peek inside the mind of an artist, is to see the world in a different way. For those awaiting their trip to the stars, and even those with their feet planted firmly on the ground, The Sentimentalists will perform mind reading and magic later in the evening for onlookers and bear witness to the first-ever, in-air mind-reading performance from a Hot Air Balloon, right before their eyes. "If there is one thing that can be said about any Hendrick's Gin soiree, it is that guests can expect to be unexpectedly and simultaneously, enlightened and bewildered," said Alvin Ramchurn, National Brand Ambassador, Hendrick's Gin. The Hendrick's L.E.V.I.T.A.T.R.E. will be tethered to Nathan Phillips Square, a bright and beautiful beacon of light at the center of one of Toronto's most cherished cultural events. 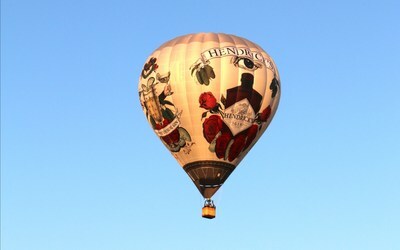 If curious passengers haven't already secured a coveted Golden Ticket, there will still be opportunity for a select few to take flight by visiting the Hendrick's Hot Air Balloon at City Hall, the pinnacle of this year's installation. To learn more about the whimsical world of Hendrick's Gin, visit www.HendricksGin.com. Note to Editors: The Hendrick's L.E.V.I.T.A.T.R.E. stands for Levitating. Elevating. Voluminous. Illuminating. Tantalizing. Amazingly. Towering. Roaming. Eye. Hendrick's Gin is a deliciously super premium gin, made with a number of unusual twists to deliver a most curious arrangement. Unlike ordinary gins, Hendrick's Gin is distilled in Scotland, in miniscule batches of only 500 litres at a time. Only Hendrick's Gin is made with infusions of cucumber and rose petals, alongside a blend of 11 botanicals, producing a wonderfully refreshing gin with a delightfully floral aroma. Hendrick's Gin is made in a combination of a Carter-Head and Bennet copper pot still, creating a divinely smooth gin with both character and balance of subtle flavours. Find us on Facebook at www.facebook.com/hendricksgin , on Instagram at www.instagram.com/hendricksgin/ and on Twitter at twitter.com/hendricksgin. The event hashtags are #hendricksgin & #hendricksballoon. Nuit Blanche Toronto is the city's annual all-night celebration of contemporary art, produced by the City of Toronto in collaboration with Toronto's arts community, and funded by the Government of Ontario and Tourism Toronto. Since 2006, this award-winning event has featured almost 1,400 art installations by approximately 4,900 artists and has generated over $311 million in economic impact for Toronto. Information and updates are available at nbto.com, on Facebook at facebook.com/nuitblancheTO, on Twitter at twitter.com/nuitblancheTO, on Instagram at instagram.com/nuitblancheTO. The event hashtag is #nbTO17.